TGIF! 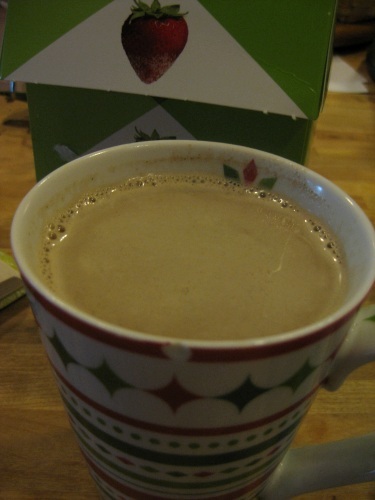 Back in my non-vegan days, I used to look forward decadent coffee creamers over the holidays like Coffee-Mate’s Peppermint Mocha to turn my morning coffee into a seasonal dessert. Of all the flavors, peppermint was my favorite reminding me of peppermint stick ice cream and swiping candy canes from the family Christmas tree as a kid. Today, however, I’m paranoid of hydrogenated oil and really am not thrilled of dumping it in my coffee every day. And I’m cheap, I could easily go through a bottle of that a week which adds up. But I still like the flavors and shouldn’t have to go without just because I’ve transitioned to a whole foods vegan diet, right? When I started making my own nut and seed milks at home, I started with almond milk because that was the first recipe I learned. But it’s a pain with soaking nuts 8+ hours in advance, straining the pulp, then freezing the pulp for future use to not waste it. Ugh. Since then, I’ve discovered hemp milk and am spending a lot less time making it because there’s no soaking or pulp-straining involved. 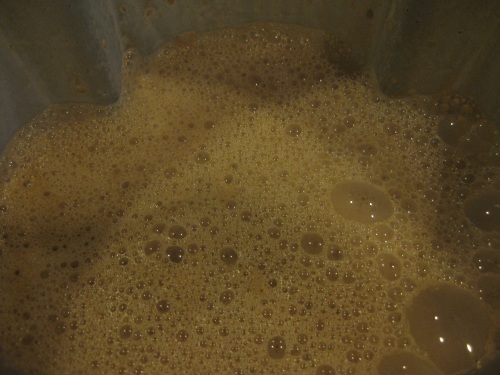 Hemp milk has a thicker, creamier texture that I like in coffee and chip seed puddings more. And I prefer the higher protein content in hemp seeds over almonds. But it could be better, hemp milk can also be festive for the holidays without the scary list of ingredients. How about a simple ingredient list that takes under 10 minutes to create a healthified version? You can get hemp seeds at most health food stores, such as the Whole Foods bulk food bins, which I started out doing. But I started going through so much hemp seeds with all the recipes, sauces, breads and milks that it got too pricey to buy that way. Currently I order bulk 5 lb. bags of hemp seeds from Amazon. Since I go through one of these bags every 2 months, saving 15% with Amazon’s Subscribe & Save works out well. And the seeds can store for a long time in the freezer with no defrosting required before use. 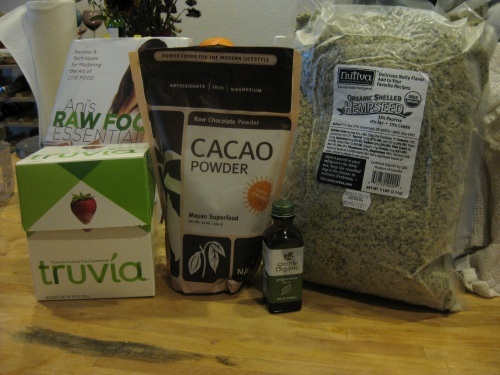 I also order the cacao powder from Amazon. You can get cheaper, smaller amounts from health food stores, but it lasts awhile in the pantry too and I go through a lot making desserts and treats over the holidays. 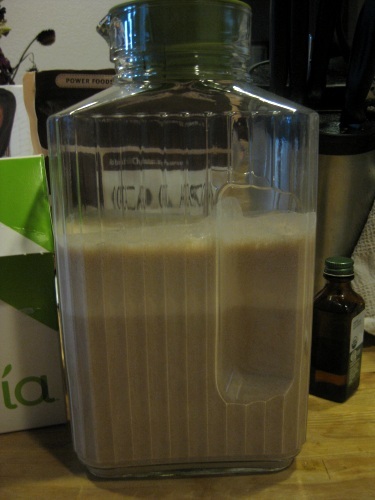 Blend all ingredients in a high-speed blender until thoroughly mixed and frothy. Enjoy! It should keep in the fridge for 5 days, but it usually doesn’t even last that long for me with smoothies, coffee and puddings. And it is fabulous in coffee, dare I say much like a peppermint mocha coffeehouse treat, only much cheaper and healthier. 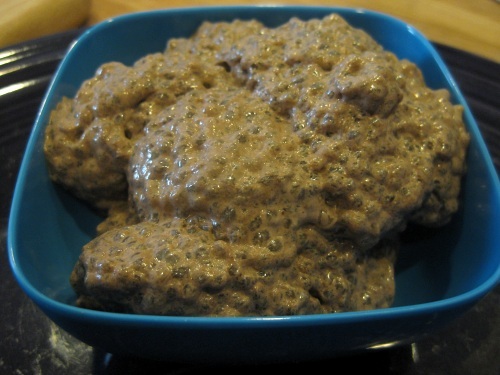 And then there’s the chia seed pudding, oh my! Mix all the ingredients in a small bowl, let sit in the fridge for 20 minutes and enjoy. This is a wonderful treat that I’ve been enjoying a lot with lunch or for dessert. I could eat plain chia seed pudding or gel because I love the texture and taste of soaked chia seed, but having a creamy chocolate peppermint flavor really makes it feel like a splurge. As we head into the busy, stress-packed holiday season, I highly recommend treating yourself to this no-guilt seasonal flavor. Go, treat yourself now! This is a GREAT idea– those commercial coffee creamers are so full of crap. I love this! Thanks! So true on the crap part, I was shocked when I looked at the ingredient list for the Coffee-Mate creamer – lots of preservatives, but it only has a fridge life of 14 days?!? ok so i confess, i LOVE coffeemate flavors too. As in, if I ever had a dairy nonvegan indulgence, coffeemate vanilla makes my heart go pitter patter but you’re right, full of hyrdrog crap oils, very $$ and those bottles go…FAST if you like the stuff like i do. I am totally gonna finally try hemp milk. Your easy tutorial, the froth and CREAMY factor have me hooked as a coffee substitute except i am gonna swap vanilla for p-mint extract. Most nondairy/vegan creamers, i.e. so delicious, the soy based ones, etc…are too “thin”. yours looks thick, like real cream..and god, i want it! The last post…the desserts…holy heaven! The pb cup with lucama caramel in it. Wow. I reallyyyyy want that! New to your blog…I was searching for a Coffee-mate alternative. Thank you for this recipe! Where did you get your milk container? I’ve been looking for a square-ish nut milk (glass with a lid) container for the fridge.